A few days ago, I went over and visited a really cool "Pinteresting Party", hosted by Tutus & Tea Parties and Here's to Handy Andy (which are both really awesome blogs, and you should totally check them out). While there, I saw a really super-cute craft by Two Sasters. They shared a Handprint Flower Bouquet. 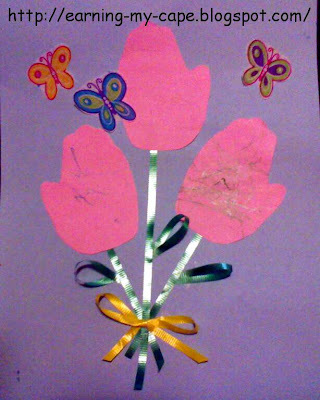 I loved it so much, that I wanted to make it with my kids! We altered ours a bit. We decided to make pictures. We used colored paper, crayons, curling ribbon, and butterflies cut out of some leftover streamers. My 5 year old made this one. I helped my 1 1/2 year old with this. Making little crafts like these is a perfect opportunity for a "teaching moment". Flowers, and how they grow from seeds (or bulbs), and how bees pollinate them. Butterflies and how they change from caterpillars to butterflies. Size- the size of their hand compared to your hand or their sister's or brother's hand. Compare bigger and smaller. Measuring- measure the flower stems and the flowers, etc. Preschoolers can explore colors and you can reinforce the color names. Really, anything you can think of at the time can be a learning experience or just a fun way to have conversation with your little ones. Thank you! And thanks so much for the idea!!! 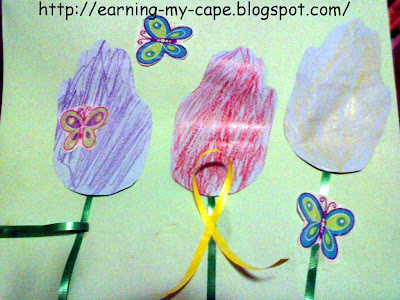 Susie, What a sweet art project to do with your children and a great way to bond with your kids! Even though my children are now 14 and 12, we still do craft projects together. I found you through Fantabulous Friday at Little Becky Homecky. I'm looking forward to seeing more of your creative ideas! Hi Sharla! Thank you and welcome to my lil' blog! :-)!